Concept for a redesigned Metropass, with stronger, more iconic imagery. Among the litany of complaints passengers often reel off about the TTC, its branding, signage, and design identity don’t usually make the top of the list. Easy to dismiss as frilly and superficial, these subtle markers shape our day-to-day experience with the transit system—and they can be especially significant for newcomers or tourists, those still learning their way around. If you’re a veteran rider, wayfinding can blend into the background to the point of oblivion: you don’t notice whether a sign clearly indicates where the bus is, because you already know. And transit-users inured to the taped-up sheet of paper, often torn out of a spiral notebook, that is often used to convey special announcements at subway collectors’ booths, may lose sight of the fact that there actually are alternatives to this DIY approach. But even lifelong riders admit that the TTC could use a bit of spit and polish, some sprucing up in the aesthetic department. 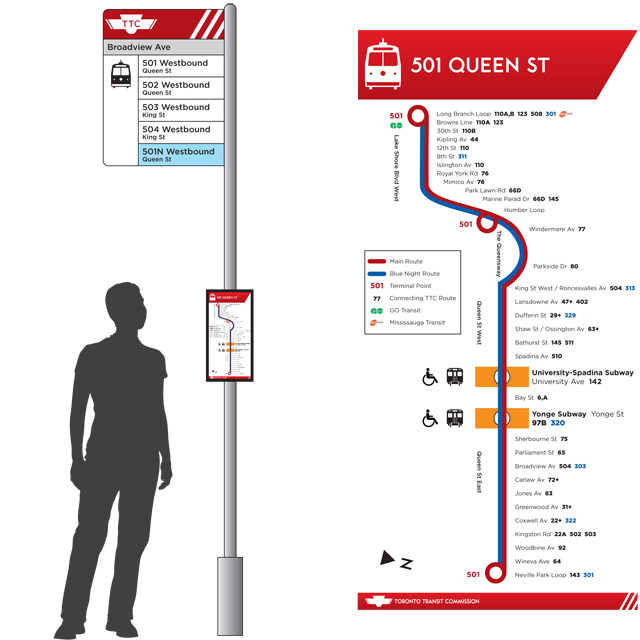 Enter local graphic designer Blair Francey, who recently created a complete package of design elements for the TTC. (You can view the full design package on his website [PDF].) Ranging from a revamped logo to new information panels at bus at streetcar stops, the design package gives concrete shape to what a rebranded TTC might look like—and why it might make a difference. Francey hasn’t been commissioned by the TTC to look at its branding—this is a completely independent exercise. As a lifelong TTC rider who recently moved to London, England for a few months, Francey became struck with the differences between the two systems and their approach to branding. He created his design package as a sort of think-piece, an imaginative exercise that shows how much room for growth the TTC has in this particular department. Surface route stops could do a better job of showing how routes interact with one another, and be easier to spot in the first place. We chatted with Francey over email to learn more about his designs and the thinking behind them. Blair Francey: Branding for any organization is key to the public’s perception in so many ways. When many people think of branding they think of a logo and that’s where it ends. But in fact, a company’s “brand” is everything from the logo to philosophy to print material, uniforms, website, advertising, and even customer service. It encompasses a company’s ethos, tells their story on a multitude of levels. Anyone looking at the current state of the TTC will see a confusing mess of half-baked ideas, hand-scribbled signs, and inconsistent use of its logo. Why, for example, on the subway maps does it have “Ride The Rocket” in one font (that is not used anywhere else in the system) and then “The Better Way” placed under the logo in a smaller, different font. Which message are they trying to get across? There are two competing taglines. There’s also no consistent use of what “Ride the Rocket” refers to: is it the streetcar, subway, buses or all three? Across the entire system, signage is a mess. The TTC did a pilot project on the Bloor-Danforth line at St. George, where they put signage above the trains on the platform to indicate the route and direction, but then left it there after the pilot project and didn’t implement it anywhere else. (Except the Sheppard line. Joe Clark has an excellent essay on typography and signage used in the system.) If you go to any collectors booth, it is awash with half designed, half handwritten signs all over the place. For any Torontonian, let alone a tourist, it’s incredibly difficult to figure out how much cash fare to pay, when the last train is, or any other information pertinent to their journey on the system. The Metropass is something that could be a collectors item or at least more visually appealing for its users. It has always felt slapped together with awful colour schemes and designs, and tiny [reprints] of the oddest pictures. Everything feels last minute or put together in Microsoft Word. 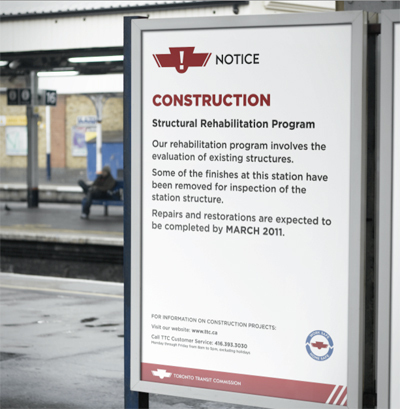 One of the weakest spots in the TTC’s information communications is addressing temporary changes—construction, delays, and so on. A more polished approach might look like this. With so many negative things happening in the past few years to the TTC (strikes, fare increases, sleeping workers, confusion about Transit City etc. ), the name “Toronto Transit Commission” has taken a bit of a beating. The image of the logo or mere mention of the name can invoke strong emotions in anyone familiar with the TTC. Part of the reason why I think it is important for the Commission to think about a rebranding is because they are entering into a (potentially) exciting phase of growth and development with the introduction of new subways, new streetcars, and integration into a larger system in southern Ontario (with the help of Metrolinx). They’ve also just hired their new Customer Service Chief which is fantastic and part of the process of regaining the public’s trust. The next thing they need to do is present themselves as a unified organization. Ramp up the advertising and marketing. Be consistent in messaging. Pick a font and stick with it (for the love of God!). Improve street signage like the bus/streetcar stops so you can see them from further than 10 feet away and offer more information about the route serviced at that stop. I think with so many other things going on and such a tight budget, the TTC has never really given its design much thought. But they should. It should always be on their mind—proactive and not reactive. They may have tried with their “Transit Stuff” store at Union Station (which always made me sad), but slapping your logo on a t-shirt and charging $15 does not create the type of loyalty something like the Underground merchandise does. They need to bring a designer in-house to create some sort of brand standards, or hire it out to a firm so that there is someone who is dedicated to ensuring the system is presented in a professional and confident manner, and not look like it’s slapped together with [duct tape]. TTC Chair Karen Stintz (Ward 16, Eglinton-Lawrence) agrees that the TTC could improve in the design department. “There’s no question that branding and wayfinding, communication…could be better,” she admitted frankly. “I’m looking forward to [new chief customer service officer] Chris Upfold joining the organization and helping us think through how we handle information communication.” Citing the role of branding, wayfinding, and other signage to the rider experience, Stintz went to on say that a comprehensive examination of the TTC’s approach to conveying information will be part of a renewed focus on customer service—and hopes that it will be part of rebuilding the TTC’s fractured relationship with the public.